9 ft Grasshopper - Single Axle - Ground Wheel Drive - Medium Capacity - High Clearance - Fertilizer Lime Spreader Opmized for Row Crops and Sod or Turf Farms. Our high ground clearance 5 ton fertilizer – 7 ton lime spreader designed for precision application of top dressings and row cropping. A rounded payload capacity of 180 cu, ft. (6.7 cu. yds. ), the stainless steel or carbon steel hopper is 9 ft. long and 8 ft. wide with 45 degree angle of repose sides. The ground clearance is 23” with standard 21.5 x 16.1 Flotation tires, minimizing compaction. Higher ground clearance can be achieved with optional 11.25 x 28 tires. A ground wheel drives the 16” stainless steel mesh chain for a spread rate automatically adjusting with travel speed. Spinners are powered by a PTO. or tractor supplied hydraulics. Hopper construction of either 304 or 409 stainless steel or carbon steel. 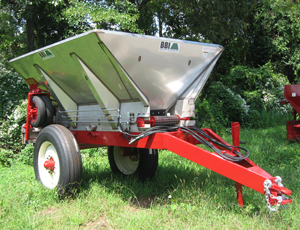 Suggested Use: Distribution of Granular Fertilizer or Lime - Medium Capacity - High Clearance - Classic Single Axle Applicator for Turf Farms, Pastures and Row Crops. Designed with High Clearance to straddle rows.